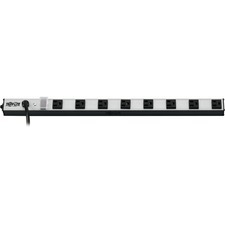 Product Name: 8-Outlet Vertical Power Strip, 120V, 15A, 10-ft. Cord, 5-15P, 24 in. Marketing Information: The PS240810 provides a 15-amp, 120v power strip with 8 standard NEMA 5-15 outlets in a rugged, all-metal, mountable housing. It allows for both vertical and horizontal mounting, making it ideal for a variety of uses including office, rackmount, workbench, industrial and telecom applications. With a NEMA 5-15P, 10-ft. power cord, you don't have to install the PS240810 next to outlets you already have; it can be mounted across the room and deliver reliable service where you need it most. A lighted and covered On/Off switch helps prevent accidental shut-offs, while a 15-amp circuit breaker guards against dangerous circuit overloads. Its sturdy all-metal extruded aluminum housing stands up to demanding network, laboratory or factory environments. Like every Tripp Lite power strip, it comes with Lifetime Warranty for guaranteed peace of mind. 8-Outlet Vertical Power Strip, 120V, 15A, 10-ft. Cord, 5-15P, 24 in.